We are always pleased to see people new to hunting in the hope that they will enjoy it every bit as much as our members. A popular misconception is that hunting is exclusive and elitist but we hope we are nothing of the kind. 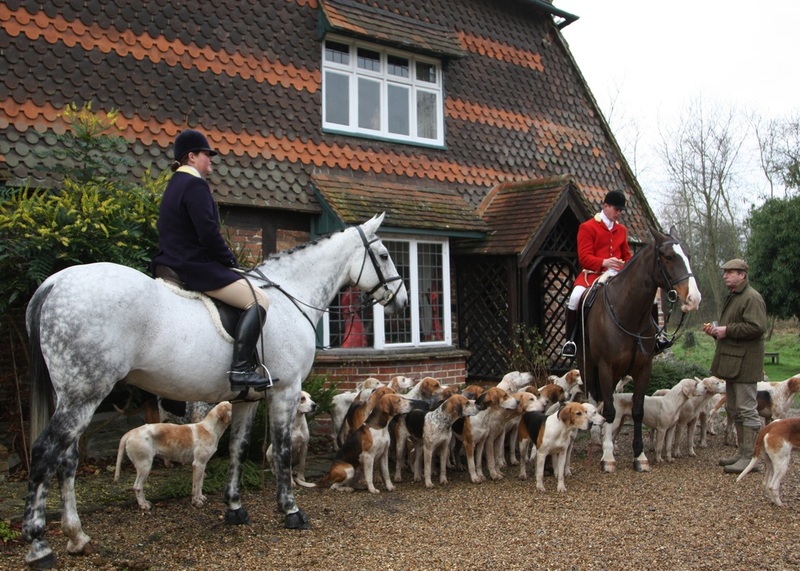 Indeed people tell us we're a friendly hunt and we very much hope that's true. Really we're a club of people with a common interest in horses, hounds and the countryside. Like all clubs we thrive on new membership and aim to welcome new members and encourage them to share our enthusiasm. How do I find out about hunting? Contact one of our Secretaries (see Contacts page for details). She can give advice as to which of our meets will suit you and your horse best and make sure you are introduced to people who can show you the ropes. Alternatively come to our Newcomers Meet, generally held in October. We do not publish our meet card on the website since it can be subject to change, particularly in difficult weather. There are also a few meets suitable for newcomers listed on the Events page. 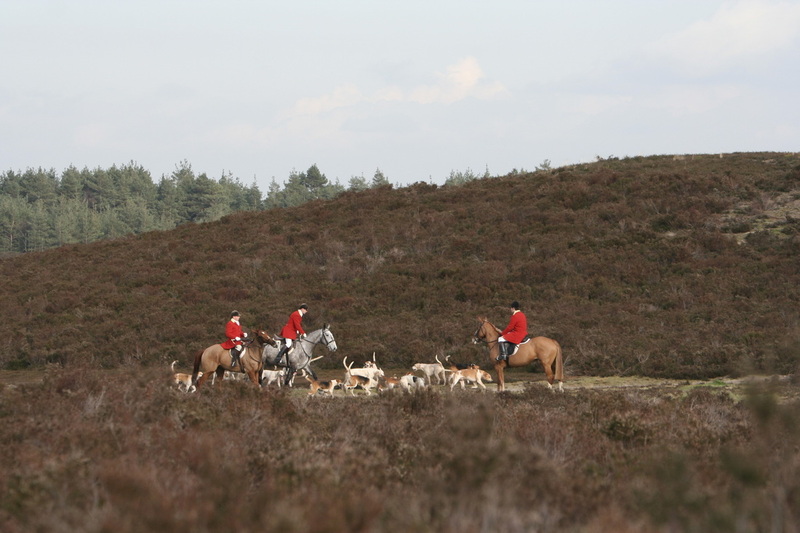 Footfollowers are welcome too and should contact the Hunt Supporters' Club Secretary for details. Well, if you subscribe it is no more than a golf membership or many other leisure activities. Details of all the different types of membership and their cost can be obtained ﻿HERE﻿, but you are welcome to come out as a visitor paying the day rate or "cap". At the Newcomers meets the rates are halved and there are also various concessions for Riding and Pony Club Members. Foot followers will be asked for a small donation if they are just present for the Meet, but around £5 would be expected if you were to actually follow the hunt and spend the day with us. Our Secretaries can put you in touch with good local hirelings and we routinely recommend Chessington Equestrian Centre. They take some care to try to ensure you are well matched with your horse and will ask you to have an assessment ride in advance of hiring. The charge is currently £160 for a horse for a weekday and £180 for a Saturday. Sounds expensive but in line with elsewhere and when you consider you get your horse delivered, polished and plaited, and that at the end of the day someone else deals with the mud, it starts to sound like a bargain! With a careful choice of venue, and our Secretaries can advise on this, because of our varied country we can usually find a meet to suit most levels of competence. Hunting in the Weald will always involve jumping and we would advise people who are not confident of crossing the country to avoid this area. At the other extreme we have the woodland of the North Downs and the open commons west of Guildford where you need never leave the ground. If your level of confidence lies somewhere in between, there are meets where jumps are available if you're feeling bold but avoidable if you're not. One word of warning though: however placid your horse is at home, he will probably get very strong when he's in company and you will need to think about your brakes! Yes, like all clubs there are rules but we don't expect you to know them in advance. Mostly they are commonsense to ensure everyone's safety. As far as dress is concerned it's enough for horse and rider to come out clean and tidy. Time enough when you've been bitten by the hunting bug to invest in all the kit. A tweed jacket with buff breeches/jodhpurs are ideal, though you will see that hunt members from Opening Meet until at least mid March will wear black/blue hunt coats. Back protectors/air jackets are fine if that's what you're used to. As far as horses are concerned it's probably best to opt for sober colours ... the pink boots and numnah may just mark you out as a newcomer! 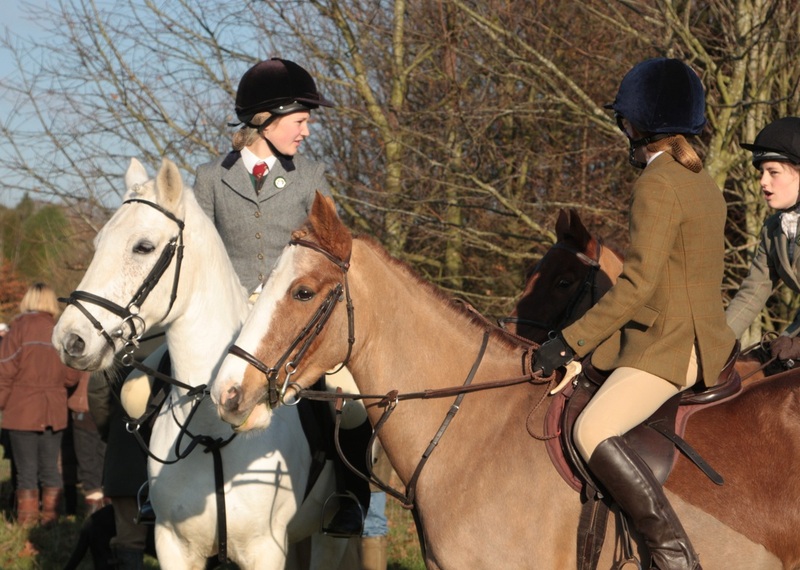 If you are interested in the etiquette of hunting, click on the link for a few notes which were prepared for Pony Club Members but have relevance for all.